I was watching the Orlando Magic play the Indiana Pacers over the weekend and thought to myself, "What if Victor Oladipo just becomes the new Rodney Stuckey." On paper, it makes sense: an explosive shooting guard drafted by a sub-par team to take over point guard duties. An organization wallowing in anonymity because of poor coaching and free agent moves ultimately shoves a talented player into a role he's uncomfortable with. Then I kept watching the game and Oladipo reminded me that he's more Dwayne Wade than Stuckey, that the Magic drafted Elfrid Payton whose ceiling is barely visible, and that Aaron Gordon just started his first game. Before the season, I lamented all of the stars (potential or otherwise) that currently reside in the Central division: Lebon, Love, Kyrie, George, Hibbert, David West, Rose, Wiggins, Jabari. And that's being cautious. Pau Gasol, Noah, and Jimmy Butler could also be thrown in the mix. Brandon Knight isn't terrible anymore. And then there's the Pistons. Andre Drummond made Team USA, which means something to some people. But Drummond hasn't played in the fourth quarter of the Pistons' last few games because he can't make free throws. The future looked hazy for the Pistons. 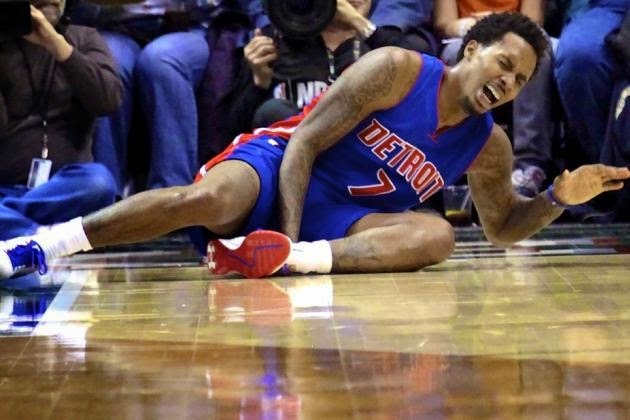 I didn't see the Brandon Jennings injury. In basketball terms, it means that DJ Augustin and Spencer Dinwiddie take over the point guard duties, the former a shoot-first microwave, the latter a rookie. What it means for the Pistons zeitgeist is more damaging. Jennings has been maligned and miscast throughout his career as a selfish, shoot-first point guard. Only one year in Jennings' career (his second) did he drop below the top 16 players in assists per game, this season coming in at 12th. His assist/turnover ratio is at 3.02, ninth in the league among qualified players, and behind the likes of JJ Barea and Andre Miller who play half of the minutes that he does. Jennings promised to live up to the lofty Natural Point Guard expectations when he came to Detroit, saying that a better group of teammates would allow him to blossom as a passer. Despite a horrible season for the franchise, Jennings posted career highs in assists per game (7.6) and assist rate (29.0) last season. Jennings' issues have always been his shot selection, finishing, and defense. The latter isn't changing, but Stan Van Gundy became his shepherd. Jennings is ball dominant, which is one of the reasons he's often thought of as being shoot-first. He sharpened his teeth in the Drew League after eschewing college for a short stint overseas. These pro-am leagues are notorious for shoddy defense and flashy offense, the kind of setting Jennings thrives in. Without an offense that could take advantage of Jennings' considerable talent, he struggled to find a niche in the NBA as a consistent player and winner, one of those nebulous terms like "grit" in football that people use to describe why a player performs as he does without the backing of any objective data. Van Gundy (and the loss of Josh Smith cannot be overstated) set Jennings free, putting the ball in his hands and allowing him to do his thing inside the structure of the offense. When Jennings wasn't screaming the ball up court, he was usually dribbling through walls of defenders and collapsing the defense, opening lanes for the Pistons' barrage of outside gunners. If he didn't have the ball in his hands, it was usually because it was floating softly toward the rim for a Drummond alley oop. Since the Great De-Smithening, Jennings had developed into the visage that he promised and that his game always alluded to. It was clear watching Jennings--and to a greater extent, the Pistons--that this is not the same team that has been crumbling since 2008. Jennings became a whirlwind, Drummond has a baby hook that works 100% of the time 38% of the time, the bench is filled with players that you'd see spelling starters on contenders, Greg Monroe emerged from his cocoon as a stumpy-armed butterfly. In essence, not another Rodney Stuckey. I realized while exhaustively live-Tweeting another Pistons game that this is why I bring up Kentavious Caldwell-Pope so often (sorry about that by the way). Detroit pre-Jennings injury was a good team and would have pushed for the 6th playoff spot in the East down the stretch, but to become anything more than what they are, KCP needs to turn into whatever demigod I've envisioned him to be. With Jennings firing on all cylinders and Drummond being Drummond, the Pistons needed a consistent outside threat that could also make up for some of the defensive inefficiencies in the lineup. Because for as good as Drummond is, barring huge improvements in his post-up game, it's hard to pinpoint where his ceiling might be. It's possible he's already there. It's equally likely that he develops into more of a terror. But KCP stands as a known entity, at least in regards to his ceiling. Losing Jennings changes all of that. Augustin, despite his ability to score in bunches, has proven incapable of running this offense at a consistent, high level. Dinwiddie is a wild card, but tellingly, is a second-round pick. Losing Jennings for the rest of the season doesn't derail everything the team had going, but the hope that was building is stalled. The Pistons' January 10th win over the Brooklyn Nets was the most important game this season. The team had just won seven straight games, a streak that was broken by the Atlanta Hawks. Smart people on the internet preached caution about swelling hope in the fanbase: Meeks won't continue shooting this well, Jennings will revert to the mean, the strength of schedule was low. Losing to a bad Nets team would seem to prove much of this right and swing the tide of momentum away from the Pistons. But that win, however meaningless, proved that this wasn't a fluke. Losing Jennings feels like that Nets game in perpetuity. How much of what we saw was real? Will the Pistons rise to those levels again? What does next season bring? And when Jennings returns, will a lower leg injury change how he plays the game? I've always been sympathetic toward Jennings. I don't have a reason to be, but his game is visually pleasing: ball fakes, quick trigger dribbling, flashy passing, hot streaks (oh, the hot streaks). His development stood as the Pistons' fastest way to relevance. He looked comfortable for the first time on an NBA court, which was heartwarming. And while nine months is a long time to wait for an answer to whether or not Detroit will remain an up-and-coming franchise, it's difficult not to anticipate that they will following this last month.